That's the end of the night's action here. Check out our FA Cup index for all of the goals and highlights, and we'll see you for Bolton v Liverpool tomorrow. BBC Cambridge reporter Sam Edwards. He travelled up to Manchester in a supporters' coach, only for it to break down around 18:00 GMT on the M6 motorway. He arrived at Old Trafford with only half an hour left, after a Warrington coach company heeded his panicked calls for help. @edwardssport: Thanks for the messages. I'm lucky enough to be working and in a car on way home. Feel for fans who booked days off and on coach back. So do we, Sam. So do we. Sunderland manager Gus Poyet on 5 live Sport: "We played well the the first half, really aggressive and high. We were in control and I was happy with our performance, and I'm happy with the final result. Today my players enjoyed playing their football. That was one of the first games this season that I've been really happy, watching my team play." Preston manager Simon Grayson on 5 live Sport: "It's been a disappointing few weeks for us but tonight is an excellent result. We've been lacking attacking options and confidence recently, but we're getting those players back now. But there was a massive incentive tonight to play Manchester United, and it brought out the best in us. "It's a massive result, and there was a massive carrot for us. Forget Manchester United, we just wanted to get back to winning ways. This result can hopefully now galvanise our league form. "I'm sure it will be very difficult to get tickets for Deepdale, but I'll limit those I give out to people who came to places like Crawley and so on in January." Apologies if I earlier said that Bradford will play Fulham in the next round - it is of course Sunderland! What a total idiot. Manchester United boss Louis van Gaal talking to the BBC: "Cambridge have played very well, a very organised team and with the mentality that was superb. The fans were fantastic from Cambridge United. We have done what we had to. "Every club in the FA Cup wants to win, we also. We have to beat Preston and that will not be easy, they won away against a cup fighter like Sheffield United, so it will be difficult for us to win in Preston North End. "For the club, the fans and the coach and my staff, we want to win a title this year. The biggest chance is the FA Cup, but we still have to win four games to do that. "Tonight, I don't think we played a very good match. But it is always difficult against a defensive team. We could have done better but I am pleased with the result." Who are favourites to win the FA Cup now? Manchester United are the highest-ranked side still in the competition. There is something magic about Louis van Gaal's pronunciation of 'Preston North End'. Wonderful. The replay between Liverpool and Bolton is live on BBC One tomorrow night. Cambridge manager Richard Money: "I was really pleased with them second half. To come in 2-0 down and play with purpose and control is not easy but we did that. Manchester United midfielder Marouane Fellaini: "It's important to win a trophy so we will try, we work hard for that. We are winning at the moment but we continue to work hard. The manager is the boss and decides where I must play. Jean Pelletier: Man Utd look good for Wembley this year. Sam Burnett: Bit of a cakewalk in the end really, for Manchester United. The gulf in class was evident. Fair play to Cambridge though, they worked their backsides off. Luke: Cambridge should be proud. Louis van Gaal was forced to select the strongest United side to better them. 3-0 over two legs? Not many can top that. Manchester United midfielder Juan Mata has been involved in 15 goals in 15 FA Cup appearances (scoring six, assisting nine). Can he nail down a place in the first team though? "Outstanding win for Preston tonight!" A reminder that you can watch the goals from Old Trafford and Craven Cottage via the highlights tab at the top of the page. We'll also have full highlights of both games later. BBC Sport's Simon Stone at Old Trafford: "Manchester United's performance can be analysed in numerous ways. "On the negative side, a bizarre formation, strange early reliance on long balls up to Marouane Fellaini and far too many misplaced passes. "On the positive, reliance on Fellaini paid off, and 24 hours after the departure of Darren Fletcher after almost 20 years at the club, eye-catching performances from two more home-grown youngsters, Paddy McNair and goalscorer James Wilson. "Ultimately though, this competition is about being in it - and they are, with a trip to League One Preston standing between them and a quarter-final berth. "As for Cambridge, they will be talking about the one that hit the post from Tom Elliott for years." Blackburn Lad: Moyes as pundit for the Man Utd v Preston match? Yes please! Surely the Beeb can make it happen, can't it? Red Malazan: Beckham should pundit the Preston game! A few Cambridge players have shirts from the Manchester United lads, but none of the amber shirts have been swapped. I forgot that they have been outlawed from doing so. Richard Money calls his players into a congratulatory huddle in front of the 6,000 away fans. "Let's take this memory into the league and kick on..." he'll be saying. Or similar. There it is, it's all over. Cambridge boss Richard Money salutes the fans as his players battle it out for the shirt swap. Great move from Cambridge, their best since the opening minute, as Tom Elliott finds Cameron McGeehan inside the box but he shoots wide. "This is what it's all about, being at Old Trafford as a Football League fan. This will live long in the memory for these Cambridge fans, particularly that incredible achievement of the first tie, drawing with Manchester United." The 6,000 away fans are still bouncing and making plenty of noise. A terrific effort, having done battle with the M6 on the way too. They've not been embarrassed and will have that tremendous showing in the first leg to look back on for many a year. And £1m+ in the bank too. Preston v Manchester United, 13 nights time, round five of the FA Cup. Can anyone think of a suitable pundit? It's 43 years since Manchester United played Preston North End but they'll meet again at Deepdale in a fortnight. Cambridge make a late change as Ian Miller, who was injured in the play-off final at Wembley, gets another taste of the big time. BBC Sport's Simon Stone at Old Trafford: "That's two in four games now for James Wilson. "Interesting he has been given a chance off the bench despite the presence there of Radamel Falcao. "The 19-year-old does not look out of place in this company that's for sure. And strikers who drop deep, as Wilson likes to do, give defences a headache." Ashley Young is back with an overhit cross from the left as we enter the final 10 minutes. It's a very subdued atmosphere. "They have done as well as you could have expected, for Cambridge. They had a glorious chance early on. I expected Manchester United to do more when they had the ball, but ultimately I suppose this is a satisfactory result for both sides, really." Manchester United or Cambridge's trip to Preston will be live on BBC One on Monday, 16 February. Get yourself to Squire's afterwards. It was 50p a pint on Mondays as I recall. Ashley Young is on after his injury. 12laus: Preston manager Simon Grayson has beaten United before! Beckford with the only goal for Leeds! Neil Leverett: Surely we'll be seeing David Moyes at Deepdale in round five? "That's nice for James Wilson, and a good finish after a nice little turn. Low and hard into the bottom corner, not giving the keeper any chance. That will do his confidence no harm whatsoever." That tie will be a big deal in Preston, and after a run of no wins in seven it could kickstart North End's faltering promotion push too. Simon Grayson has an FA Cup win over Manchester United under his belt. Wayne Rooney is close to a fourth but mishits his shot. And Preston will host Manchester United. Deepdale Duck will be buzzing. Sunderland will play Bradford in round five. A nice moment for Preston striker Joe Garner, who ends an injury absence of more than two months by coming on for the last three minutes. He starts with an ambitious shot from 40 yards. You can do that when you're 3-1 up. "It was a great penalty, to be fair. It looked like a soft award to me though. The referee immediately pointed to the spot, but the Fulham fans are not happy with that whatsoever." James Wilson has been lively since coming on up front for Manchester United, and he gets his goal, taking a pass from Ander Herrera and firing in left-footed from the edge of the box. Jordi Gomez - who won the FA Cup with Wigan - slams powerfully home from the spot in front of the 4,000 travelling fans. Sunderland are through. Nikolay Bodurov lunges in from behind to try to nick the ball but hauls down his man - that's a penalty. Ander Herrera gets a run out, replacing Angel Di Maria in the Manchester United midfield. FIVE MINUTES added on. Can Fulham find an equaliser? "Manchester United were simply unable to unlock Cambridge in the first fixture, but here the game opened up after United scored their first goal, which completely changed the complexion of the tie." Nice from Juan Mata, a smart backheel to find Angel Di Maria 25 yards out, and his drive is powerful and well turned over by Chris Dunn. Excellent save. Robin van Persie is replaced by James Wilson and the Dutchman makes his way down to the tunnel, applauding the crowd on his way. An injury concern? Preston looking comfortable as they head towards victory at Bramall Lane. Paul Gallagher has had a couple of sights of goal as he chases a hat-trick, whizzing one shot over the bar and rolling another wide. Sheffield United may have lost just two of their last 17 FA Cup ties, but they've only three minutes to save this one. Liam McLaughlin: It's going to be a long 10mins - come on Preston! Joe Wilkinson: I had pretty much written them off at half-time, but Preston got in the dressing room, got their heads together and started to believe. Will Rawlinson: Joe Garner will absolutely tear up this Manchester United defence! And that is an excellent stop from Chris Dunn. Down to his left to push out Robin van Persie's smart shot on the turn. All of 40 minutes left to enjoy. A stunning 10-minute spell from Preston has put North End on the brink of a massive cup tie with Manchester United. Can Sheffield United rally in the late stages? Angel Di Maria whips in a bullet of a shot, gem of a hit, but it is brilliantly and bravely blocked by Josh Coulson. For those Cambridge fans making their way to the ground with our reporter, it may be a bit of a damp squib when they do arrive. Not much tempo or drive to the game now. The referee has a lengthy stoppage, during which he gets both linesman onto the pitch, and in the end he decides on two yellow cards. One for each side. What a letdown after all that. "Ricky Alvarez was on the right wing, cut back inside on to his left foot, got a bit fortunate as the ball fell for him but he ht it with venom and it's a fantastic goal for what could be the winner." Wayne Rooney with a cracking effort, dipping strike that forces Chris Dunn into an awkward save, can only cough it up into the mixer and Robin van Persie should really bury it. He slams it over the top though. David Shaw: Are we looking at a derby in the next round of the FA Cup, Preston vs Manchester United? Sunderland have been pushing hard and now have the lead, Ricky Alvarez cutting in from the right and arrowing a left-footer into the bottom corner. He's been the best player on the pitch. "A lovely touch from everyone in Old Trafford, standing and clapping Luke Chadwick off the pitch." Well, this is extraordinary. Preston get a penalty as Chris Humphrey is brought down, and Paul Gallagher blasts the ball into the bottom corner for his second of the game. Are Sheffield United, the cup kings, about to be vanquished? A nice moment for former Manchester United midfielder Luke Chadwick as he is given a heroic ovation from all four stands as he comes off. On comes Gearoid Morrissey. Sam Edwards and those stranded Cambridge fans. @edwardssport: Thank you to driver Gaz for the pick-up! Into the last 20 minutes at Craven Cottage. Sunderland building up a head of steam but they've not really tested Marcus Bettinelli since his howler in the Fulham goal. That's another stinker of a cross from Marcos Rojo. Luke Shaw's place is safe at left-back if he keeps that up. A fast turnaround at Bramall Lane, with Preston coming from a goal down to lead in next to no time. It's centre-back Paul Huntington with his second goal in two games as he heads in Scott Laird's corner. As it stands, we are heading for a fifth-round tie between Preston and Manchester United. Marcos Rojo shanks a woeful cross out of play as Manchester United start the second half brightly. Back under way at Old Trafford. Next goal either kills or revives the game. "It was a harmless cross into the box from the left, it took a deflection but it was a dolly of a catch and Marcus Bettinelli has spilled it into his own net. It's a horrendous mistake by the goalkeeper to gift Sunderland a goal. It's a poor, poor mistake." Sunderland very near indeed to going ahead for the first time as Italian midfielder Emmanuele Giaccherini curls wide from the edge of the box. The goals are coming thick and fast now, and are we heading for extra-time? Paul Gallagher does it again. The on-loan Leicester forward scored a stunning free-kick in the first tie at Deepdale 10 days ago, and he's done it again with a pinpoint set-piece into the top corner. Mark Howard has no chance. Preston could have been level just before that, with Howard making an excellent double save to stop first Scott Laird and then Chris Humphrey. The game at Bramall Lane is most definitely on. Oh dear. Oh dear, oh dear. Slapstick goalkeeping from Fulham's Marcus Bettinelli gifts Sunderland an equaliser as he juggles Patrick van Aanholt's speculative cross under little pressure and drops it over the line. BBC Sport's Simon Stone at Old Trafford: "Very different emotions in the respective dressing rooms at half-time. "In the visitors' Tom Elliott will be going over and over in his mind the first-minute chance that could have given the game a sensational start and a memory of a lifetime. "In the hosts' Paddy McNair should be feeling very pleased with himself. "The Northern Irishman played a key role in the opening goal by switching play with an astute pass. And, after some early prompting from Wayne Rooney, has become a very useful attacking outlet from his right-back station." The question for Preston here is: Do they risk bringing on Joe Garner? Their 12-goal top scorer has been out of action for more than two months with a tendon injury, but is on the bench tonight, and may yet be needed. Not much in the way of clear chances so far in the second half, although home keeper Mark Howard has just stopped Tom Clarke's header from a Paul Gallagher cross. Fulham have a chance to double their lead and again it comes from a deep cross, Alex Kacaniklic heading wide. Chris Deans: Does it matter what system Van Gaal is using? It's working on the night. Danny Hacking: What excuses do Man Utd need to make, Steve Claridge? They're 2-0 up. Bob: Alright Van Gaal, we've got the 2-0 lead with the long ball. Can we start playing properly now? "Manchester United have done what they have had to do, no more, no less. It hasn't been particularly fluent, but they are getting the job done. And I remain totally unconvinced by what Louis van Gaal is doing tonight." Just like the first half, it's been a frantic opening from Sunderland. Left-back Patrick van Aanholt has the ball at the far post but drags his shot into the side-netting. Big chance. Cambridge had the chance to score after 51 seconds but now it looks like Manchester United will face Sheffield United in the next round. Great feet from Robin van Persie as he pirouettes away from danger, like a Dutch Zidane, but he can't quite get a shot away from a tight angle. Almost at half-time. He's coming! He's on his way! BBC Sport's Simon Stone at Old Trafford: "Marouane Fellaini has been a central figure in both goals, so perhaps there is enough evidence in that alone for Louis van Gaal to feel he got his tactics spot on. "What we can never know, of course, is what would have happened if the hosts had been less direct and played at a quicker pace." Oh dear. Jermain Defoe has a sight of goal for Sunderland but scuffs his effort horribly, a real pea-roller that barely reaches the goal. "No excuses tonight from Manchester United. A wonderful pitch, no wind. No reason not to perform very well. "I still have no idea what system Van Gaal is playing in his midfield. Van Persie is stuck up on his own, and that's as much as I can make of it." Back under way at Fulham, and at Sheffield United too. Better from Cambridge as they get dangerman Ryan Donaldson into space for the first time, he drives on and puts over a teasing cross/shot from the right - but there is nobody in amber to tap it in. Dion Dublin would've bagged. @edwardssport: Still awaiting pick-up. Coach is now just one junction away. So driver tells me. All Manchester United now, it's very comfortable. Cambridge haven't looked like hurting their illustrious opponents since that golden chance in the opening minute. We are able to bring you the goals from two of tonight's FA Cup replays - and you can see Fulham's opener now. Just use the Highlights tab at the top of your screen. Le Millenium: Here comes the onslaught. Elliot Leaver: United could get quite a few here. That goal probably ends this tie as a contest, Bradford came from 2-0 down to beat Chelsea, but that was miraculous. Cambridge's gameplan of containment certainly needs a major tweak. "I think that's the first time from a Cambridge perspective, from the two games, that you can say they switched off. Fellaini was completely left alone. He was unmarked, able to take it down, and he had a strike. It didn't work, and yet United were still able to get the ball back in the box and score." Marcos Rojo has his first goal for Manchester United, and it's more direct play which does the trick. Marouane Fellaini has a shot blocked from a corner, Robin van Persie returns it with a deft chip and Rojo loses his marker to head home powerfully. "It's a good FA Cup tie. Fulham were on the back foot for the first 25 minutes but they took the lead against the run of play and then have come back into the game. "Their front three of Ross McCormack, Cauley Woodrow and Hugo Rodallega can cause Sunderland problems. Sunderland will have to be weary of being hit on the counter-attack as they push for an equaliser." Cambridge defender Richard Tait loses his boot in the build-up but keeps on his man, almost cutting out a cross which runs into the path of Paddy McNair. The defender laces in a drive, really travelling, but it is well blocked by Josh Coulson. 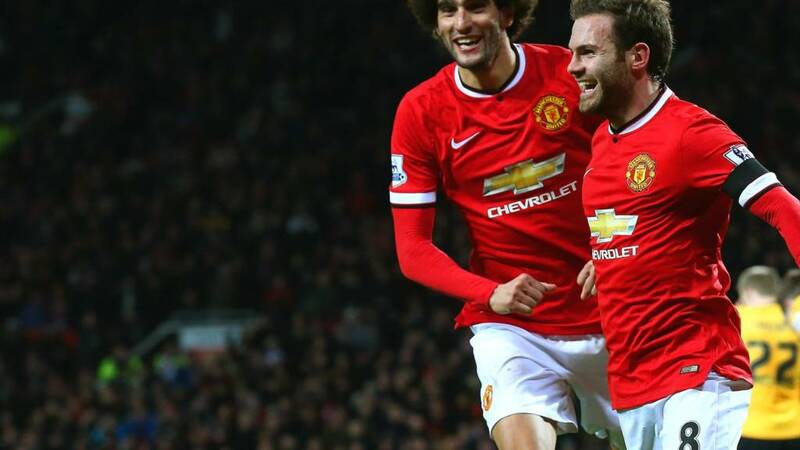 David Shaw: Get in, Mata! Spanish magician. DSSBrooks: United go 1-0 up. Finally. Slow handclap for Louis. Jamie Murphy's goal seven minutes before the break lifted Sheffield United after a sluggish start, and Jose Baxter almost gets a second just before the break, but Thorsten Stuckmann gets down to his left to save well. On the balance of first-half play, Preston can count themselves a little unlucky. As it stands then, Sheffield United will host Manchester United in the fifth round. As Big Sam would say, tiki-taka is bobbins. Or close, anyway. Manchester United have been very direct tonight but they lead. Perhaps there is method to their madness. "Fellaini should be down the middle getting on the end of balls like that. He came in at the far post and provided aerial dominance, attacking the ball. So why on earth has he been playing wide left? I had no issues with the way Man Utd played down at Cambridge, but even now they now lead I still don't know what Van Gaal is trying to achieve with this system." Fulham on track to book a fifth-round tie with Bradford then. That's why Manchester United have been hitting Marouane Fellaini - because it works. He gets up high to head down a cross from Angel Di Maria and Juan Mata is in the six-yard box, sticks out a foot and pokes it in off the bar. BBC Sport's Simon Stone at Old Trafford: "There have been moments in the opening 25 minutes - Rojo's instant control on the touchline - when the class in United's ranks show. "But there are many others when it appears they are making it up as they go along. "Plenty of misplaced passes, too many players in one area, not enough in others, Wayne Rooney having to encourage Paddy McNair to make an overlapping run to give him some room. It's all oddly disjointed." Adam in Edinburgh: For once I completely agree with Steve Claridge, LVG's tactics are nothing short of ludicrous and I now feel bad about criticising David Moyes. Owen from London: Our tactic is to hit long balls to Fellaini? Clever to out-Cambridge Cambridge. Angel Di Maria is fine now, putting in a cross from the left which is headed away. United's formation does have one flaw, the spare man on every attack is Paddy McNair on the right. He looks very uncomfortable out on the wing. Problems here. Angel Di Maria slips as he clips a ball forwards and looks to go over on his ankle. That made my eyes water! But he appears to be OK after a bit of treatment. Jamie Murphy scored twice as Sheffield United beat Swindon on Saturday, and he's on target again as Nigel Clough's side take the lead against the run of play. Murphy, who agreed a new contract over the weekend, takes on Michael Doyle's pass and strikes a low shot under keeper Thorsten Stuckmann, who probably should have saved it. For all of the consternation behind Wayne Rooney playing on the right, he's still been Manchester United's busiest player. He cuts in on to his left foot and drills in a low shot which is well held by Chris Dunn. Sunderland were excellent in the opening 15 minutes but they haven't reacted well to going behind. Jermain Defoe has been kept quiet in the last 10 minutes or so. And Ross McCormack then whistles a shot wide from 20 yards for Fulham. Has Angel Di Maria been a disappointment for Manchester United? Not really hit the heights of a £60m man. He scuffs a shot across the box before Marouane Fellaini wins another header but nobody can turn it in. Manchester United are basically going long. Sheffield United, the cup experts of League One, are having a tough time of it here, despite Marc McNulty seeing his shot deflected just wide. At the other end, Preston centre-back Tom Clarke's header from a Kevin Davies flick is well saved by keeper Mark Howard. Wayne Rooney wins a header at the back post, from this berth on the right which has really got Steve Claridge's goat. Marouane Fellaini is basically playing up front. He'd make a good targetman in League Two. "It wasn't a great corner, but it was put into a dangerous area and there must have been 14 or 15 bodies in the penalty area, but Fulham reacted quickest and they are one up against the run of play." BBC Sport's Simon Stone at Old Trafford: "Those empty seats filled up as the teams came out, but plenty were only just taking them as Tom Elliott hit the post. "A nervy start from United and their defence still looks suspect despite recent improvements." "What an odd, odd system from Van Gaal. What an odd way to put out a team with the players you've got. Fellaini on the left wing and Rooney on the right? Really? Does that fit? "Why is he even out there, Rooney? Sir Alex used to play him there, but only when they were up against the likes of Bayern Munich and Real Madrid. If I was a player playing for United I would be absolutely deflated. If I was Rooney playing out wide against Cambridge, I would wonder what on earth the manager was doing with me. What am I doing out here? It's just crazy." Entirely against the run of play, Fulham lead! Hugo Rodallega puts them ahead after Sunderland can't clear a corner, Cauley Woodrow sees his shot smothered on the line but Rodallega is there to batter in off the underside of the crossbar. That's 10 for the season for Rodallega. @edwardssport: One local coach company on way for pick up, here any minute. Breakdown recovery on the way. Two more coaches coming back to also help. Those coaches will take fans to Old Trafford. Hope remains to see the second half. "The front three of Fulham are being starved of service at the moment. Fulham are finding it difficult to get a foothold in the game and they haven't done anything in terms of a threat going forward. You wouldn't expect that with their strikeforce." Preston have come closest to scoring at Bramall Lane so far, with Kevin Davies - an FA Cup hero in 1997 with surprise semi-finalists Chesterfield - hitting the inside of the post with a chip after running on to a poor back header. It looks like a back four for Manchester United, with Paddy McNair and Marcos Rojo at full-back and Chris Smalling and Jonny Evans through the middle. Rojo puts in two good crosses from the left but Cambridge stand tall and clear their lines. What a start that would have been for Cambridge. Since then Manchester United have kept the ball at will, as you'd expect. "He was clean through, wasn't he? A stumble and stutter from the Man Utd midfield played him in, but Tom Elliott never set himself. He tried to bend it round De Gea's left-hand side but it glanced the outside of the post. What a start, and what a chance for Cambridge. They probably won't get a better chance than that all night..."
What a chance! Cambridge striker Tom Elliott latches on to Daley Blind's bad touch and he's clean through on goal, he slips as he strikes it - and curls against the post! Amazing. BBC News School Reporters Sam, Callum, Nick and Louis from Comberton Village College in Cambridge are at BBC Radio Cambridgeshire to cover tonight's game in photos. During the match they will be compiling a gallery of pictures from the match and writing the captions - and you will be able to see their efforts after the match. They have already been given a tour of the studios in the building and are raring to go. BBC News School Report works with secondary schools around the UK helping students make the news. Sunderland still well on top, as Fulham put in a Rocky-style performance in the opening moments. They are taking a battering but somehow still in the fight. The Rocky fanfare greets the players at Old Trafford, which is pretty full now. It seems most of the Cambridge fans have made it in. Does Stallone know that Manchester United are using that? As a famous Everton fan he won't be happy. Sunderland all over Fulham now, as a fingertip stop from Marcus Bettinelli keeps out another low Steven Fletcher effort. The men in blue piling on the pressure. Sunderland have the first effort of the night but Ricky Alvarez's low 20-yarder is well held by Fulham keeper Marcus Bettinelli. The keeper then has to be sprightly again to save Jordi Gomez's strike. Sunderland then have the ball in the net but Steven Fletcher is offside. All go for the Black Cats. Cambridge manager Richard Money on 5 live Sport: "We need to get out there and soak it all in very quickly. We've played at big stadiums a few times in the last few months, but tonight will be different, no doubt at that. Then we must play the game, the match, and not the occasion. "We know we played well in the first game. People may think we played above ourselves but I thought we were very good on the night, and that should give my players confidence for tonight. But this is a different kettle of fish, a different ball game. So we need to be even better, if possible. "Our fans have been great with us, and numbers have risen. The atmospheres have got bigger and better, and the reward for them for that is a day out here at Old Trafford. But we just need to make sure it's not just a day out." What's your most depressing puchase? Better from Fulham as Alex Kacaniklic drives through the middle of the Sunderland defence before Cauley Woodrow wastes the crossing opportunity on the right wing. Don't forget that the winners of this one are away at Bradford in round five. Cambridge boss Richard Money: "I think the lads will enjoy it, it's something to relish. "We've come up trumps when we have needed to in the last 18 months. Play the game, not the occasion. We know we have to play well. "It's a big night for Luke Chadwick, it was him who rang us and asked to play for us. He's gone to Wembley and got his club promoted and now he's back at Old Trafford. You couldn't write the story. "Manchester United have paid us a huge compliment with the team they have selected. I'm not surprised." What's your most depressing purchase? Michael Anderson: A Van Persie Arsenal shirt. He left three months later. BBC Sport's Simon Stone at Old Trafford: "Whether it is the traffic problems on the nearby M60 that have caused the game to be put back, the freezing conditions that have led many fans to wait to the last moment before taking their seats or a general lack of ticket sales, plenty of red seats remain visible. "Plenty of Cambridge fans are in though and making some kind of noise that can just about be heard above the music." "When both sides came out to warm-up they didn't know this would be a late kick-off. Now they're having to warm up all over again. Plus, most players have a pre-match routine - they will do certain things at certain times. It can also be superstition, and if something works for them they won't want to change it. So they're all back out again, 20 minutes before the new kick-off." Sunderland have made a dominant start at the Cottage, with Ricky Alvarez tricking his way into the penalty area - but his low cross is well dealt with by the men in white. Rich Williams: 35 Cambridge United coaches stuck on the motorway! Will Jackson: I don't think United are playing three at the back. McNair as a right-back, Rojo as a left-back and Blind playing as a holding midfielder in a 4-3-3. Andy Waters: 3-5-2 WORKS. Our dodgy defence keeps clean sheets, and we rely on our endless stock of attacking talent to get by. IT DOES WORK. Mark Taylor: Are you ready all you United haters? This will be like the boat race in 1978 as Cambridge sink without trace. Carry on hating. Preston make a bright start and have a corner well cleared. Can North End end their bad run of form tonight? We are under way at Craven Cottage, and also at the all-League One affair between Sheffield United and Preston. "I was amazed it took Fulham such a long time to give Kit Symons the manager's job. It wouldn't surprise me if he has some tricks up his sleeve and his side surprise their Premier League opponents tonight." will.one.is: Bought an A-Level revision guide on the internet, sent me the wrong one, failed the exam. A late change for Sunderland as Steven Fletcher now replaces Connor Wickham up front. Wickham must have a late injury. "It was different for Man Utd at Cambridge - it was a tight little pitch that allowed the hosts to get close to them, to squeeze them. Plus, it was absolutely freezing at the first leg. I went onto the pitch at half-time and the wind went right through you, and that does affect you as a player. "So, Cambridge try to stick to a similar gameplan. They should stick to that, even if they fall one or two behind. Stick to their guns." Gus Poyet takes his Premier League strugglers to Fulham this evening and you can listen to full commentary from John Southall and Phil Brown at Craven Cottage on BBC Radio 5 live sports extra. The teams are out at Fulham, Sunderland wearing a light blue number this evening. Sean McLelland: Delayed kick-off? How rude! I need to be up early for work! Phil Johnson: 3-5-2 doesn't work in the Premier League. Just because it's Cambridge United doesn't mean it will work in the FA Cup. Di Maria isn't a forward either. Clyde Shaw: Van Gaal should be able to play a 1-1-1-1-1-1-1-1-1-1-1 formation and beat Cambridge. Relax Man U fans. Manchester United manager Louis van Gaal on BT Sport: "Cambridge play direct, long balls. They have two strikers in their selection and they fight for every second ball. It is difficult to beat this kind of team. "Chelsea lost at home to a third-level team after being 2-0 ahead so everything is possible. Not only in England, it is not always the case that the better team is winning. We have to take care to beat the lower team. "This season the FA Cup is number one on our priority list. It is fantastic to win and it is a long time since we won this cup." Kevin Thompson: Time to watch United struggle to beat Cambridge. Paul Collins: Man Utd will win, but I don't get why Cambridge are going into it effectively believing they've lost already. That's surely not the right attitude if you want to cause an upset. They should be going there believing they can win. "I do feel there will be goals tonight. It's a very positive line-up from Fulham and I think they will get goals. But I'm a Sunderland supporter and I want to see Jermain Defoe play. Both sides are set up in a 4-3-3 formation and both will attack and score goals." Torture for those fans stranded on the M6. When will Cambridge play at Old Trafford next? I bet you won't get the coach then. @edwardssport: The coach has lost all air so the brakes and suspension won't work. Freezing. Talk of us getting taxis. What's a black cab fare off of the M6 hard shoulder? Anyone? Craig Barlow: Hope Man United repeat the Leicester game and go in 3-0 at half time. Then we will hopefully see Valdés get a 2nd half run out. Freddy Harper-Davis: Kellett should be in the starting line-up, much better than Blind anyway. We hear so often that it is a dream to be a professional footballer, so it is very interesting when a player takes the rare decision to jack it in. Today Forest Green Rovers defender Eddie Oshodi quit professional football at the age of 23. Oshodi came up through the youth ranks at Watford, but spent the last four years at the New Lawn, making 127 first-team appearances. He had his contract cancelled by mutual consent on Monday to allow him to seek a career away from the game. "Football in the lower leagues isn't going to help me work in the future," he told BBC Radio Gloucestershire. "I don't want to be thought of as 'Eddie Oshodi - all he's known for is playing football'. "I love to read and write and I love many things in life. I just think I need to focus on the other things I love to do." Will he live to regret that decision? Josh Hammond: 3-5-2? again? Really?! How much longer will it take for Van Gaal to realise that it doesn't work? Mike Martin: Strong line-up... Cambridge taking no chances. Luke Parsons: I honestly think Cambridge will get starstruck and fall apart. 4-0 to United. But can they knock out a team from their own league this evening? And there you go - no sooner have I spoken, and the game has been delayed. @edwardssport: Driver's saying the problem more serious than I thought. Other coaches are coming to get us once they've dropped off. Another hour. Fans on this coach are furious. I've not heard anything to suggest that this game will be delayed Chris. Those Cambridge fans marooned on the M6 have quite frankly had it. Chris Williams: Not delaying the kick-off at Old Trafford would be criminal surely? Denying 6,000 fans a once in a lifetime opportunity! selection of striker Diafra Sakho. Sakho, 25, withdrew from Senegal's Africa Cup of Nations squad with a back injury but scored 18 days later in West Ham's 1-0 FA Cup win at Bristol City. Fifa rules state a player cannot appear for his club if he is meant to be on international duty. World football's governing body has begun an inquiry but the Hammers "vigorously" deny any wrongdoing. If West Ham are found guilty, Fifa could order the Football Association to overturn their victory over the League One side. Rob Underdown: This year's Blackpool season ticket. resigned from his post at QPR. Redknapp, 67, won the Cup with Portsmouth in 2008, with Joe Royle's win with Everton in 1995 the only other win for an English manager in the Premier League era. We reckon that Manchester United's starting XI cost £231m to put together, which incidentally is £231m more than Cambridge's. Can the zeroes be heroes? "Cambridge can play here tonight in the same manner as the first leg. I expect them to line up with one up front, one just behind and two solid banks of four. They won't look to lave any space in behind, no gaps between the lines, and they will want to play in exactly the same manner as the previous game." BBC Sport's Simon Stone at Old Trafford: "Louis van Gaal has caused a surprise by naming David De Gea in goal. "Victor Valdes is still to play a first-team game after signing an 18-month contract and tonight looked like the perfect opportunity for his debut. "The former Barcelona man will be on the bench again though as United look to book a fifth-round trip to Sheffield United or Preston." Tom in Sheffield: Based on the teams they've played in the last two seasons in both cups, if Sheffield United were in the Premier League right now they would only be three points behind Leicester with a goal difference of +3 and having played an incredible 15 games fewer! Amazing. Sheffield United boss Nigel Clough, who made 10 changes for Saturday's 2-0 League One home win over Swindon, reverts to the starting line-up that ran Tottenham close in the League Cup three days earlier - only centre-back Chris Basham remains from the weekend. Preston's 12-goal top scorer Joe Garner returns to the bench after more than two months out with a tendon injury. Boss Simon Grayson makes six changes, bringing in goalkeeper Thorsten Stuckmann and midfielder Neil Kilkenny for the cup-tied Sam Johnstone and Daniel Johnson - while recalling 37-year-old Kevin Davies, a boyhood Sheffield United fan, in attack. Sheff Utd XI: Howard; Flynn, Basham, McEveley, Harris; Doyle; Campbell-Ryce, Scougall, Baxter, Murphy; McNulty. Preston XI: Stuckmann; Laird, Clarke, Huntington, Woods, Wiseman; Humphrey, Brownhill, Kilkenny; Gallagher, K. Davies. Cambridge winning at Old Trafford. It's not going to happen. Not a chance. Never. Bradford winning at Chelsea - particularly from 2-0 down - so you never can tell. Would a Cambridge win this evening be an even bigger shock? @edwardssport: Our coach now has mechanical problems. Stranded on a layby on the M6. Our sympathies, Sam. But really, you should have left earlier. BBC Sport's Simon Stone: "The deadline-day departure of Darren Fletcher to West Brom means that there is no-one left in the Manchester United squad who has an FA Cup winners' medal from their time at Old Trafford. "Three United players do have one though. Robin van Persie was part of the Arsenal side that defeated United on penalties at the Millennium Stadium in 2005. Juan Mata started Chelsea's victory over Liverpool at Wembley in 2012. "The third, less obvious, name is Angelo Henrqiuez. The Chilean is presently on loan at Dinamo Zagreb. He was also on loan at Wigan, when he was named on the bench for the Latics' shock 1-0 win over Manchester City in 2013." Tonight's 5 live sport began at 19:00 GMT as Mark Chapman and guests digest the fall-out from transfer deadline day, Harry Redknapp's resignation and more. Then, from 19:45 GMT we have full commentary from Old Trafford where John Murray is joined behind the mic by former Cambridge striker Steve Claridge. delayed on the M6 and are far from certain to make it to Old Trafford in time for kick-off. Bad news for Fulham as club captain Scott Parker is not fit enough to play and is not in his side's 18-man squad. Jazz Richards, on loan from Swansea, is cup-tied so Jack Grimmer comes in, with Seko Fofana and Alex Kacaniklic also starting. Lasse Vigen Christensen is among the substitutes. Fulham XI: Bettinelli, Grimmer, Hutchinson, Bodurov, Stafylidis, Fofana, Tunnicliffe, Kacaniklic, McCormack, Rodallega, Woodrow. Luke Chadwick starts a game at Old Trafford tonight for the first time since December 2001. That was a 1-0 defeat by West Ham, and he was replaced on the hour mark by a certain Mr D. Beckham. I can confirm that Beckham is not on the bench for Cambridge tonight. "I had to scrape the snow off the car this morning. I went into work early, then nipped out, got on the coach and am making my way up. The coaches left Cambridge at 1pm - plenty of time to get up there early. "In the last 12 months we have already been to Wembley twice. We won both times and we have a fantastic manager, Richard Money, who prepares the team well. "Louis van Gaal seems to be worried about us, and we're at Old Trafford to cause an upset. If they don't show up, or if we get a goal early and they panic, then anything's possible. There have been Cup upsets in the past and it's only 11 v 11. The Amber Nation is in Manchester tonight. We won't be fazed inside Old Trafford." Vito Mannone plays in goal for Sunderland with Costel Pantilimon dropping down to the bench, while Ricardo Alvarez and Emanuele Giaccherini also start. Adam Johnson is out after needing surgery on a thumb injury and Sebastian Larsson also misses out. Sunderland XI: Mannone, Reveillere, van Aanholt, Vergini, O'Shea, Bridcutt, Gomez, Alvarez, Giaccherini, Wickham, Defoe. BBC Radio Cambridgeshire's Sam Edwards reports that around 1,000 or so Cambridge fans will not be at Old Trafford for kick-off or any of the build-up after traffic trouble on the M6. He is on one of the fans' coaches and it is currently 47 minutes away, but that is without factoring in parking and walking to the ground. Kick-off in 49 minutes. BBC Sport's Simon Stone at Old Trafford: "More than 6,000 Cambridge fans will be at Old Trafford tonight - and they have no intention of being put off by ticket prices in excess of £40. "It was £46 for each adult and £18 for the child's," said Tim Heffer, a Cambridge fan of 31 years, who was at the game with partner Kerry, family friend Michael and 11-year-old son Luke. "By the time we have paid for petrol there won't be much change from £250. "We wouldn't miss tonight though. In all my time following the club there has never been an occasion like this." He is not expecting the visitors to claim a fifth round tie with Sheffield United or Preston though. "If we only lose 3-0 we will have done well," he said. The big news for Cambridge United is the fact that ex-Manchester United man Luke Chadwick starts. He is one of two changes from the side beaten at Luton at the weekend. Cambridge XI: Dunn: Tait, Coulson, Nelson, Taylor: Chadwick, Champion, McGeehan, Donaldson; Elliott, Simpson. It's an all League One affair at Bramall Lane, in fact it's fourth v sixth. North End have hit a sticky patch of form though, with no wins in their last seven games in all competitions, while the Blades were mighty close to taking Spurs to extra time in last week's League Cup semi-final. This evening Manchester's tram system, the Metrolink, has been flooded by fans of both sides, all heading to a floodlit Old Trafford. Supporters in red: "You need a new stand, you need a new stand! You're at Old Trafford, cos you need a new stand!" Supporters in amber: "Dah dah dah! Thank you for the toilets! Dah dah dah! Thank you for the toilets." BBC Sport's Simon Stone: "One player not involved at Old Trafford tonight is Jesse Lingard, who joined Derby on loan for the remainder of the season yesterday. Manchester United are committed to Lingard though. The midfielder has agreed a new two-and-a-half year contract at United and Louis van Gaal paid a warm tribute to the 22-year-old in the match programme ahead of tonight's FA Cup replay with Cambridge. "Jesse was desperately unfortunate to sustain a knee ligament injury on his debut for the club on the opening day of the season," said the Dutchman. I have been impressed by Jesse's determination during his rehabilitation." Dave Doggett, Cambridge United chairman, on 5 live Breakfast: "Old Trafford is not a stadium we play at regularly, in fact I think the last time were were there was 23 years ago. "We know the players will do us proud as they always do - they will go out and enjoy the occasion. We'll have over 6,500 supporters there and hopefully the atmosphere they'll create will inspire our players. "This is the great thing about football - until the final whistle we'll still be in the tie. It's a great occasion and something we're really looking forward to. It would be great if we manage to hold out, and if it goes to penalties I'll be left with a few fewer fingernails!" Manchester United make five changes from the side which beat Leicester at the weekend - but it remains a formidable looking line-up. Juan Mata is back in. improving the toilets at the Abbey Stadium. The FA Cup remains a game-changing competition for some clubs. There are certainly more exciting things to spend money on, but sometimes we all have to swallow a dull, but necessary purchase. So what is the most depressing purchase you have ever had to make? A large, wallet-draining expense on something you knew full well you would gain no joy from at all. I'm talking new carpets. Having a new boiler fitted - four grand I was quoted last week! Four thousand pounds! - stamp duty, estate agent fees. Wedding rings. That sort of thing. I'm sure you can do better. And Premier League Sunderland will also be hoping to make it into round five after a replay at Fulham. Only one of the last 10 matches between Fulham and Sunderland has ended as a home win (five draws, four away wins). The Black Cats have lost just one of their last nine FA Cup matches against lower league opposition (W5 D3 L1). Is that the whiff of penalties I sniff in the air? Tough ask for North End? There are three FA Cup replays tonight. The TV cameras may be at Old Trafford but we will also bring you all of the developments at Bramall Lane. Sheffield United have won 12 and lost just two of their last 17 FA Cup matches, while Preston have won just one of their last 19 away trips to Bramall Lane - losing 13.